Clive joined the Royal Air Force straight from Southampton University in 1973; by 1989 he was a Wing Commander. He commanded No. 3 (Fighter) Squadron – the first Germany-based Harrier squadron to convert to full night operational capability, as well as participating in air operations in Iraq and Bosnia. He was awarded the OBE following this tour. Later, as Air Commodore, he was responsible for RAF and RN Harriers, and subsequently had operational oversight of Afghanistan operations. As an Air Vice-marshal, he liaised between the military hierarchy and our politicians during the Iraq war. 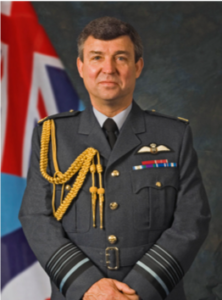 In 2004, Clive was appointed Deputy Commander-in-Chief Strike Command as Air Marshal and was made a Knight Commander of the Order of the Bath in 2006. Prior to his retirement from the RAF in 2009, Clive was promoted to 4 star, with responsibility for the day-to-day running of the RAF with 31,500 RAF personnel under his command and oversight of a budget of £2.62 billion. More recently Clive became the first Police and crime Commissioner for Leicester, Leicestershire and Rutland. He presided over the implementation of £20m annual savings and youth policies that cut offending and re-offending; Clive stood down in 2016. Married to Alison, Clive has 3 sons and 3 grandchildren and lives in Wing, Rutland.